Devastating floods swamped Southern Louisiana in August 2016. Residents and business owners were forced to evacuate, and when it was safe to return, many discovered their homes had been destroyed or severely damaged. It was a terrible mess that left many wondering how to clean up, rebuild, and move forward. Then, on August 18, Storm and Disaster Recovery Teams were deployed by Servpro—a pioneer in storm team disaster work and a leader in fire and water restoration—to help put the pieces back together. As a member of the American Red Cross Disaster Responder Program, Servpro was one of many partner companies that provided aid to thousands of people in the weeks that followed the natural disaster. This is one example of the monumental work Servpro has accomplished since its founding in 1967. With more than 1,700 franchises in all fifty states, a 24/7 National Call Center, and proactive partnerships with state, local, and government agencies, Servpro’s coverage network is second to none. And in addition to disaster recovery, Servpro also services individual homes and businesses damaged by fire, water, and mold. Located right outside of Nashville, Tennessee, is Servpro’s corporate headquarters, an advanced hub of resources for its network of franchisees. The 250,000-square-foot, state-of-the-art facility is also where Matt Preston, general counsel and corporate secretary, has overseen the company’s risk and government affairs legal functions since he joined the company in 2012. He and his legal team of eighteen work to mitigate risk while driving the business forward in discovering effective ways of leveraging franchise relations to reach Servpro’s goals. Recently, Preston has also taken on overall leadership of Servpro’s global franchise sales and development division, an area that he is particularly passionate about. 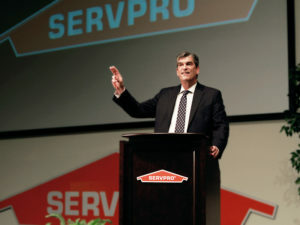 While Servpro expanded into Canada in 2010 as part of a strategic growth plan, Preston is confident that the next phase of the expansion will take the company overseas. Based upon Preston’s extensive leadership and international franchise experience with companies such as Yum! Brands, he is more than familiar with the requirements it takes for preparing to enter international markets. The key to that success is following the Servpro operating system. “We draw the outline and invite our franchisees to fill it in as they like. We encourage and appreciate differences between individual franchises, but we ask them to stay within the lines of the Servpro system because it’s been proven, tried, and true,” Preston explains. As a result, this process creates a win-win situation for all parties and has enabled Servpro’s impressive growth, poising the company for international expansion. Preston has worked quickly in his four years with Servpro, having already established valuable programs and systems to improve company operations. He has also developed a strategic trademark enforcement program to protect the Servpro brand, which has experienced great success. And that is in addition to his establishment of a state-of-the-art litigation management program, which has been paying impressive dividends through a coordinated approach of applying management principles to repetitive litigation. “When I see an opportunity to make changes that will bring improvements, I go after it,” says Preston, who is a self-proclaimed, cautious change agent. “But ultimately, I have an excellent team, and that is what’s most important. Preston provides vision, leadership, and strategy for his legal team and the global franchise sales and development division. He serves as counselor, strategist, and business partner to his executive colleagues. He cultivates relationships with franchisees and outside partners. But regardless of the role he takes on, Preston knows that his ultimate job is to empower each of these various teams and individuals to do what needs to be done to reach Servpro’s vision of being the premier cleaning and restoration company in the world.